Last week I wrote about Tucson’s Reid Park, and featured many of its amenities. This week I’ll be discussing the many neighborhoods around Reid Park. There is a diverse range of housing available within less than a mile of Reid Park. There are high end historic homes as well as affordable townhouses and condos close by. So whatever your needs are, you can find a home in one of these popular neighborhoods. If you are looking for a home located in central Tucson within walking and biking distance of recreation and shopping, look no further than one of the neighborhoods near Reid Park. San Clemente is the neighborhood directly east of Reid Park. It is bordered by Broadway, Alvernon, Timrod, and Columbus. It earned the National Historic District designation in 2005. San Clemente features a grid pattern with curvilinear streets to slow traffic & create a distinct community. The neighborhood, which consists of about 225 homes, was started in the 1920s, but most homes were built in the 1940s – 1950s. Homes are typically between 1600 sf – 3000 sf. The neighborhood is in TUSD school district and is serviced by Lineweaver Elementary, Vail Middle, and Rincon High schools. The first on is Randolph House, which was built in 1949. Most units are about 700 – 1200 sf and are typically priced at around $80,000 – $100,000. The architecture and grounds of this community are very unique with the extremely lush landscaping and a ton of charm. 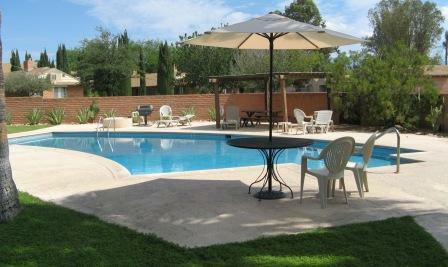 There is a community pool in the neighborhood too. Eden Roc Gardens is another community nearby that is just north of the Doubletree Hotel. This community features very spacious units between 1100 – 1500 sf in size. 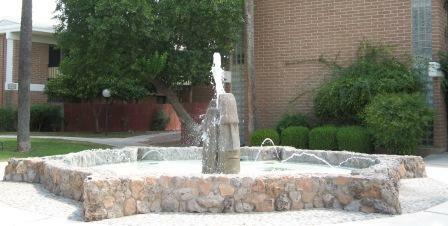 There is a nice sized community pool and a unique Easter Island style fountain in the common area.